Ugh…we’re so close to getting back to school. 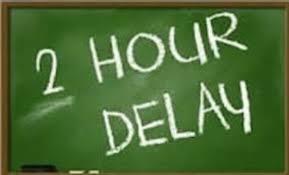 Today, due to the dangerous slick roads, we have a two-hour delay today. This will allow time for salting of the main roads– and make it safer for our busses to travel. School will begin at 10:45 am. If you are normally at the bus stop at 8:20, be there at 10:20. If you normally drop your child off at 8:30, drop your child off at 10:30. We’ll dismiss at the same time, 3:45pm.